Under the auspices of the Illinois Reading Council, ILLINOIS READS is an annual statewide project to promote reading for all Illinois citizens. Beginning with read alouds for babies, 6 books are selected for each additional age band through adult readers. The work of Illinois authors will be highlighted. What is ILLINOIS READS trying to accomplish? The mission of ILLINOIS READS is to promote lifelong reading for the people of Illinois. Beginning each spring with our ILLINOIS READS LAUNCH and culminating on the third Thursday in November with the statewide Illinois Family Reading Night, individuals of all ages will be reading from a selected list of books and engaging in activities in order to share their reading experiences with one another. What is the vision of ILLINOIS READS? We want to get everyone in Illinois reading! What is the ILLINOIS READS BOOK FESTIVAL? Each spring, ILLINOIS READS honors Illinois readers, authors, and illustrators with a celebration to launch the year's newest 36 book choices. We celebrate reading by attending an awards ceremony, meeting with authors, hearing the authors read, having books autographed, and sharing our passion for reading with book lovers of all ages. ILLINOIS READS is a project of the Illinois Reading Council. With over 4,000 members across the state of Illinois, IRC promotes literacy through professional development, an annual conference, and local literacy events. 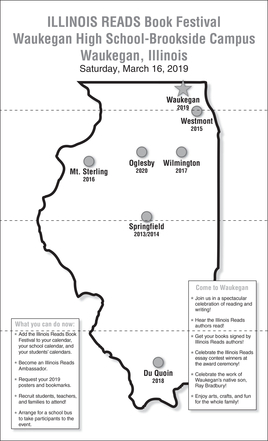 How are ILLINOIS READS books chosen? Books are chosen by a committee that includes teachers, librarians, and book sellers. Why are ILLINOIS READS books only written by Illinois authors? Illinois has produced a number of great authors! What is the criterion for ILLINOIS READS books? From board books for babies to best-sellers for adults, ILLINOIS READS selections include a mix of fiction and nonfiction, including science, technology, engineering, art, and mathematics (STEAM). How do I get promotional materials? Order bookmarks and posters from the IRC at info@illinoisreads.org. Sign up to be an ILLINOIS READS Ambassador and a small shipment will be sent to you annually. Distribute bookmarks and posters to your school and community. Share the books with your students, family, and friends. Is there a way to get books for low income area schools? Information to assist in writing a grant or to secure foundation dollars can be found on our website. Consider applying for a IRC Literacy Support Grant at www.illinoisreadingcouncil.org.